Found an Amarone “lost” in the cellar and decided to open it. It was made by Le Ragose winery, a small, family run winery on the border between Valpolicella Classica and the extended Valpolicella wine producing area. Vineyards are located on the nice hills on the northern side of Verona with a stunning view over the city. Amarone it is really and incredibly long ageing wine. In spite of being a 25 years old it was still excellent. The color was maybe a bit lighter than an amarone made today is (many producers have excluded the light colored Molinara grape), with orange highlights and tended to get cloudy fast. These old wines are quite delicate and need to be drunk quickly after opening. 14% of alchol. Amarones made today usually are more alcoholic, and is a general trend in Italian wines also due to climatic changes in the past twenty years that influence sugar content in grapes. Many Amarones from the ’80s tend to be a bit oaky. Barrique was introduced in those years in Valpolicella and, especially at the beginning, many wine makers overused it. Le Ragose at that time sticked to the old, big, un-toasted casks and the result is definitely a more elegant wine. The palate is extremely round, with tastes of dried prunes, cherries in alchol, licorice, chocolate, leather, very complex but soft. Tannins are still present but very velvety. 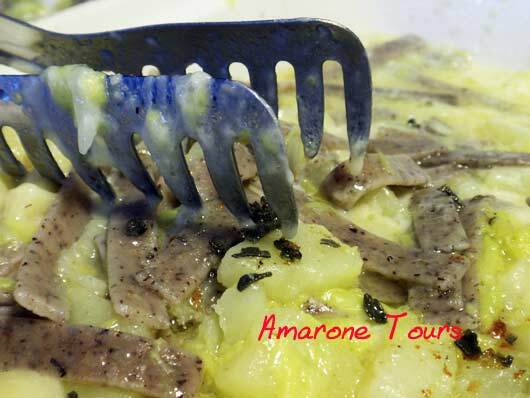 It was paired with pizzoccheri, a typical dish of Valtellina, a mountain region in the northern side of Lombardia region, just above lake Como. It is made with buckweat pasta shaped like broad noodles mixed with cabbage, potatoes, butter browned with garlic and sage, a lot of cheese (the tasty and fatty Casera in the original recipe), grated parmigiano, black pepper. Even if it is well known that Amarone is a long ageing wine it always surprises how good an Amarone can be after such a long time. In spite of being a 25 years old wine it was still excellent. The color was maybe a bit lighter than a young Amarone (many producers nowadays are not using any longer the light colored Molinara grape), with orange highlights and tended to get cloudy fast. These old wines are quite delicate and need to be drunk quickly after opening. 14% of alcohol. Amarones made today usually are more alcoholic, and is a general trend in Italian wines also due to climatic changes in the past twenty years that increased sugar content in grapes. Many Amarones from the ’80s tend to be a bit oaky. Barrique was introduced in those years in Valpolicella and, especially at the beginning, many wine makers overused it. Le Ragose at that time were still using old, big, untoasted casks and the result is definitely a more elegant wine. The palate is extremely round, with tastes of dried prunes, cherries in alchol, licorice, coffee, leather, a very complex but soft set of aromas. Tannins are still present but very velvety. It was paired with pizzoccheri, a typical dish of Valtellina, a mountain region in the northern side of Lombardia, just above lake Como. It is made with buckweat pasta shaped like broad noodles mixed with cabbage, potatoes, browned butter with garlic and sage, a lot of cheese (the tasty and fatty Casera in the original recipe), grated parmigiano, black pepper. Definetely a quite structured dish that paired perfectly with this important Amarone that maybe lacked a bit of acidity to counter balance the richness of the abundant cheese and butter. Interestingly, Valtellina, the region where this recipe comes from, produces the only other dry red wine made with dried grapes like the Amarone. It is called Sfursat della Valtellina. 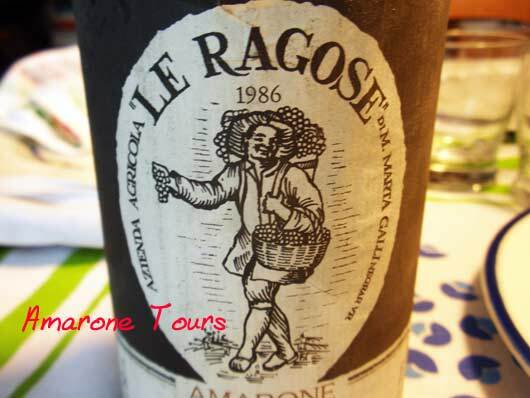 Le Ragose winery can be visited with Amarone Tours organized wine tasting tours in Valpolicella. Do not hesitate to contact us for any further information and detail.